This afternoon Al Steele's demolition crews were ready to send this City-owned East Side masterpiece to the landfill. 557 East Utica (google map) has been City-owned since February 2010. James Comerford - Commissioner, Department of Permit & Inspection Services asked Al Steele to wait - for 30 days - and agreed to stay this demolition. I asked Julian Adams from New York State Office of Historic Preservation to weigh in on the significance of this City-owned residence. Julian said: "557 East Utica is an outstanding example of how bold forms and ornament can make a house standout in a neighborhood. 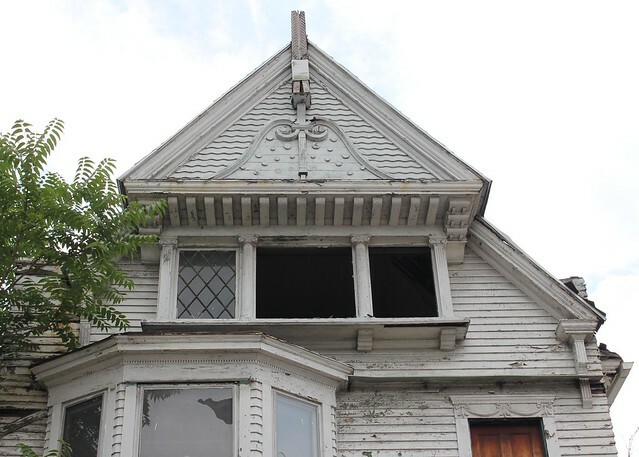 The bold broken and scrolled swan's neck decoration in the third floor gable reflects both the colonial revival style of the period as well as the exuberance of the time in which it was constructed. It adds a grace note to the street, being both a singular presence and part of a stronger historic neighborhood." The slide show reflects a strong owner occupied neighborhood in the block of East Utica near Humboldt Parkway. The level of investment in the last few years is palpable. 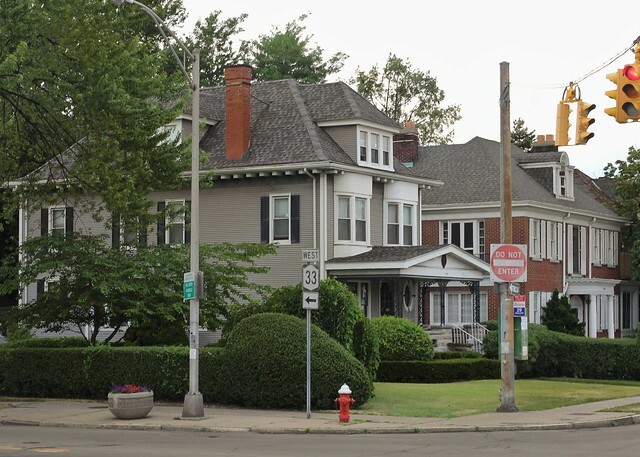 The houses at the corner of East Utica - three doors away - are some of the best examples of restored residential dwellings on the City's East Side. 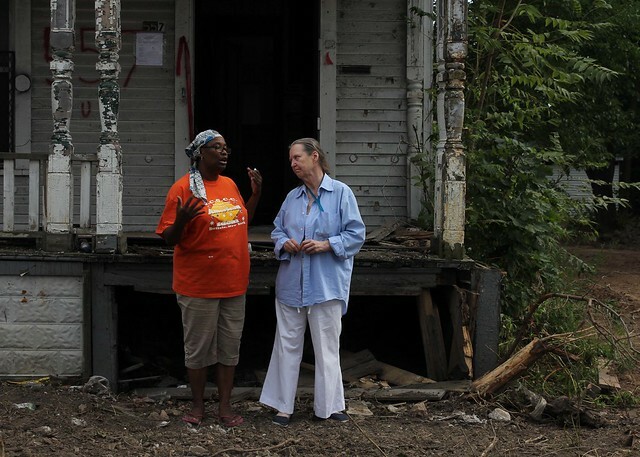 Below, neighbors discuss the fate of this magnificent home. Two neighbors - both have purchased distressed houses in this neighborhood - were discussing the importance of finding a suitable buyer for 557 this afternoon. In anticipation of the demo, Al Steele's crews removed large amounts of overgrown brush from the front lawn revealed the house's beauty that's been dormant for decades. Meanwhile three doors away here's a pic of the corner of East Utica and Humboldt Parkway. 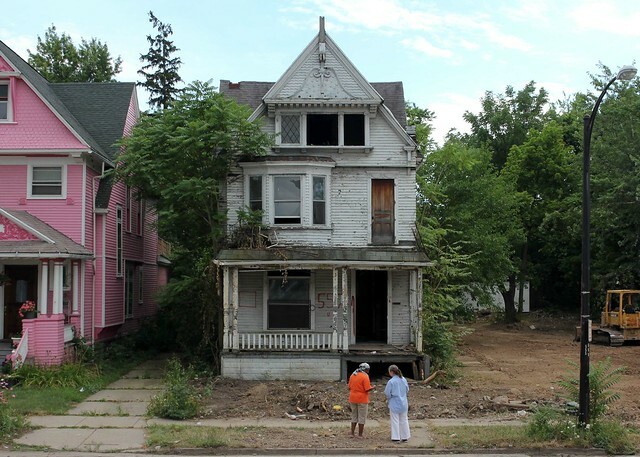 Tom Yots, Executive Director of Preservation Buffalo Niagara weighed in on the conversation with Julian Adams this afternoon. He suggested the this City-owned heritage residence may be eligable for the National Historic Register. Both Dana Saylor and Mike Puma have agreed to help anyone with the historic research necessary to help make 557 their home. Special thanks to Elizabeth Licata who fielded a phone call this morning from a neighbor who was disgusted and brought this pending demolition to my attention. We have 30 days to find a qualified owner for this City-owned property. If you're interested in knowing more and would like to take a closer look, please email me. I can also connect you to some of the residents who have been involved in renovation projects in the immediate neighborhood. Please take a moment and spread this post through your networks.